I am sorry to say we do not have any snow for snow play at this time. The weather service is call in for a storm next week so we will see. This weekend would be a good time to come on up and get in so early spring hiking in all trails are open. So come on up and enjoy YOUR National forest. This entry was posted in Snow Play - 2013-2014 on March 14, 2014 by Mike. This may be the last snow play weekend of the year unless we receive new snow. So come on up and have a great day in the mountains. The picture above was taken yesterday in the afternoon. This entry was posted in Snow Play - 2013-2014 on March 9, 2014 by Mike. Yes we do have some areas for snow play. Mostly small patches but the young kids will have fun. This maybe the last weekend so come on up. This entry was posted in Snow Play - 2013-2014 on March 7, 2014 by Mike. Today will be another GREAT snow play day. So come on up and have a GREAT day in the mountains enjoying your national forest. 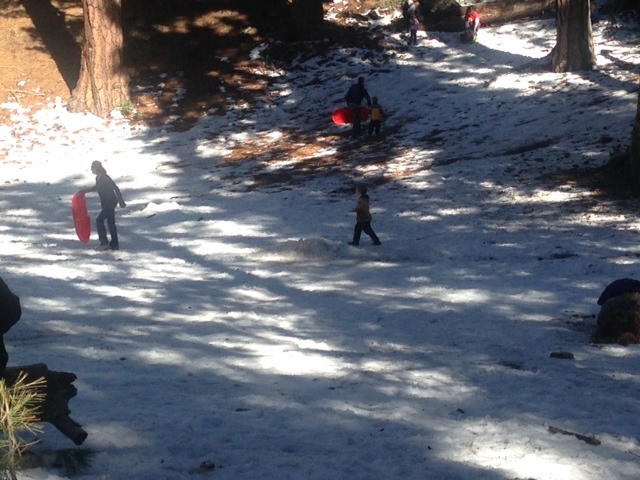 Having fun with the kids throwing snow balls and sledding. This entry was posted in Snow Play - 2013-2014 on March 4, 2014 by Mike. The snow play conditions look great. Come and get it while it lasts. We received 4-5″ in all the snow paly areas this past weekend. All roads are open with NO chain controls. Take the kids out of school and come have fun while we have snow. This entry was posted in Snow Play - 2013-2014 on March 3, 2014 by Mike. Come on up and enjoy the snow. We have received new snow the last 2 days and conditions are great!!!! The roads are open with NO chain controls and this morning it is a blue sky. So today is the day come and get it. Always make sure you carry chains that fit your car and that you know how to install them. Only play in the snow on Public lands, (stop to see us at Mountain Hardware andwe can provide you with a map and info where the best conditions are currently). Please respect private property and do not play there. You will also need an Adventure Pass $5.00 per day or $30.00 for a year we can supply that for you. Please remember to always pick up and take home any trash as this will make it nicer for the next visitor. This entry was posted in Snow Play - 2013-2014 on March 2, 2014 by Mike. Roads are open No chains (although this can change at any time) at this time all the way to Big Pines. It is still snowing we received 3-4 inches last night so snow play is good the best we have had this year. This entry was posted in Snow Play - 2013-2014 on March 1, 2014 by Mike. We did receive some snow last night. There is 3-4 inches of snow in the snow play areas. With snow still coming down. At this time there are chain controls west of Wrighwood at the LA County line. So to get to the snow play areas you will need chains at this time. We are getting heavy rain this morning. With some road flooding here is Wrightwood. Weather service is calling for it to turn to snow this afternoon and through Saturday. We are NOT recommending anyone to come up at this time. Please wait until after the storm. We should have plenty of snow at that time. This entry was posted in Snow Play - 2013-2014 on February 28, 2014 by Mike. I am sorry to report that as of this morning we have not received any new snow. So at this time we DO NOT have any areas for snow play. I will update this post when there is a change in conditions. Of course you are always welcome to call 760-249-3653 for info also. This entry was posted in Snow Play - 2013-2014 on January 31, 2014 by Mike.